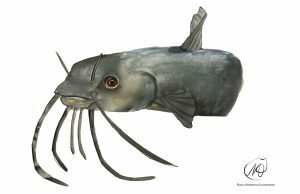 The wels catfish is a large species of catfish native to wide areas of central, southern, and eastern Europe, in the basins of the Baltic, Black, and Caspian Seas. It has been introduced to Western Europe as a sport fish and is now found from the United Kingdom all the way east to Kazakhstan and China and south to Greece and Turkey. It is a scaleless freshwater fish recognizable by its broad, flat head and wide mouth. Wels catfish can live for at least fifty years and have very good hearing to compensate for their poor sight. With respect to the Czech Republic case ClimeFish will create forecasting models to predict changes in these fish communities along the geographical and thermal gradients based on existing data on temperature-dependent growth, abundance, biomass, maturation and reproduction. The main drivers of the model will be temperature and changes of trophic state. The target species will be those benefiting from temperature increase: Wels catfish (Silurus glanis), pike-perch (Sander lucioperca) and common carp (Cyprinus carpio). We will complement these models with the analysis of detailed long-term data on recreational fisheries in the Czech Republic as a case study linking changes in fish communities to stakeholders.